Recently we asked the creator of some of the most popular new prints in the kiwiana art collection at New Zealand Fine Prints about his unusual signature. For Jason Kelly signs his humorous and quirky kiwiana style artworks not with his name but with one of two symbols. As the magnified pictures of his "signature" that accompany this article show JK's signature comprises a symbol that is his initials combined with a bicycle. "Re: My Bike. I have always ridden a bike from a nippa and had a bit of a love affair with them, always rode to school, first kid to wear a helmet back in the early eighties, it was some Italian hard shelled thing which looked like a cross between a peanut and a German helmet, I was severley grilled by my peers at school, them calling me peanut! Didn't bother me too much though. The love of bikes continued into Triathlon and now days having a small collection of oldies and a love of doing them up including English bikes, such as a BSA & Triumph"
We then asked Jason when he first started using the symbol/logo. 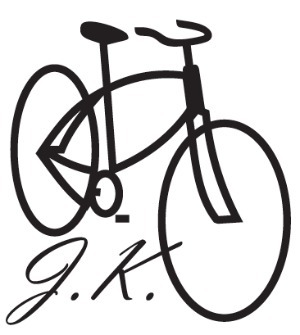 He told us "The JK Bike is like a brand I suppose, it was modeled on an old Bicycle advertisement, I was never that happy signing my work as it didn't quite do it for me asthetically, so the Bike was born and I now stamp all my Art with it ( Art only) [Jason also works as a professional signwriter]. I always sign my work on the back along with the date and replaced the indelible ink stamp with the signature early on round 2000, there are some early works floating round though that missed the stamp. The images are my artwork stamp and the "It's Hot" Bike, a bit of a piss take really, but I love flames, must be a bogan in me somewhere!" 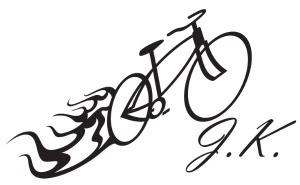 We are delighted to report that Jason has just had the JK bike tattooed on his right painting arm four times going from my wrist small to my bicep large with the "It's Hot Flames" style logo coming out of the back wheel. Jason tells us that this was to show his "dedication to the love of what I do, my brand and my love of bikes."